Looking for something your child can enjoy this summer? Try 4-H Youth Development’s STEAMer Fun Program. 4-H Youth Development is an informal, practical, learn-by-doing educational program open to all youth in Union County. STEAMer Fun consists of a series of educational activities designed to make the most of summer vacation by encouraging youth to learn with productive activities that are FUN! STEAMer Fun is open to youth regardless of prior 4-H participation. Registration will be handled on a “first come” basis and will only be accepted upon receipt of fees. Telephone registration will not be accepted. We are pleased to introduce an online registration process. 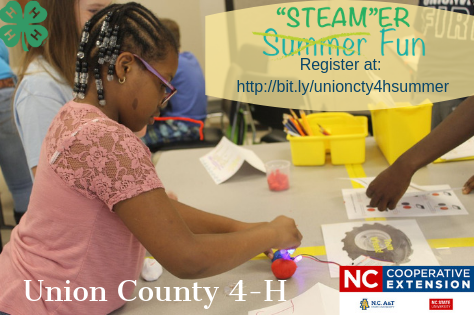 You may register your child(ren) at http://bit.ly/unioncty4hsummer. Paper registration forms are also available upon request. Check, cash, and/or money orders (made payable to Union County 4-H) are acceptable methods of payment. You may mail the information to Union County Cooperative Extension, Attention: 4-H Summer Fun, 3230 D Presson Road, Monroe, NC 28112. Early registration is recommended due to limited space available each week. Registration will continue throughout the summer or until classes are filled. All fees are non-refundable unless a class is filled to capacity or canceled. The fee (cash, money order, or check only) for each week covers all expenses including transportation to activities, program costs, and snack. All activities will be held at the Union County Agricultural Services and Conference Center located at 3230 Presson Road in Monroe unless otherwise noted.